Learn how to defeat the Chained Ogre boss fight in Sekiro: Shadows Die Twice, a surprisingly agile and strong monster capable of throwing you to your death. 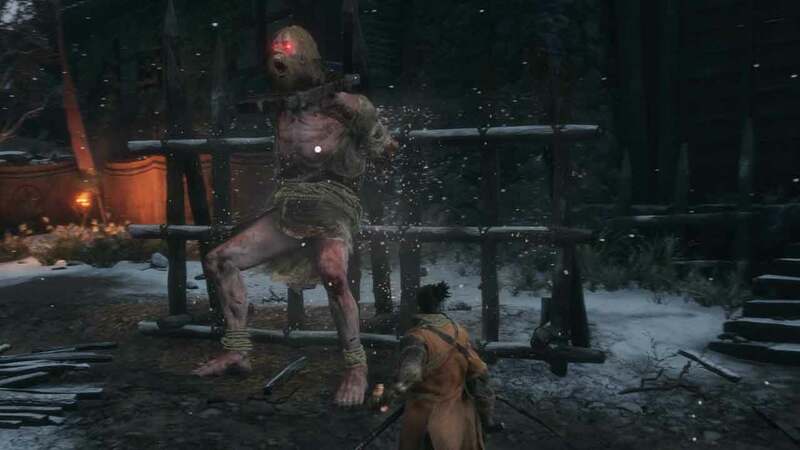 Sekiro’s Chained Ogre is likely going to be the second mini boss players face (unless they head into the Hirata Estate memory). Because the Chained Ogre is the second boss (and rather early in the game) it will likely be a difficult fight as you’re probably still learning the ropes. However, with the right strategies you can take him down relatively easy, especially if you cheese him. The Chained Ogre is incredibly susceptible to fire damage, making the oil and Flame Vent combo an excellent choice. The Chained Ogre boss fight is one of the unskippable fights in Sekiro: Shadows Die Twice. Given that this is the second boss in the game, it’s going to be quite challenging. Thankfully, given that it’s locked-up and unable to move, you can start the fight off with an advantage. Before you start this fight, it’s a good idea to either speak with the merchant down near the stables. Pay him for information until you receive the flame vent prosthetic tool or go into the Hirata Estate and find it on the fire. Fire is extremely effective against enemies with red eyes, making it a great boon for this boss. It can also be worth unlocking the Grappling Hook Attack move. This skill allows you to grapple to the ogre and attack it, dealing a lot of posture damage. It can also be used to repeatedly grapple to it, get two hits in, fall of the edge, and grapple to it again. This is one method to cheese it, but if you actually want to improve at Sekiro and stand a chance of finish the game, you’re better off learning how to attack the ogre. Thankfully, the Chained Ogre boss fight amounts to going in for two hits and then backing away. This allows you to whittle its health to zero. Once its health is empty, land one hit to fill the posture bar completely, allowing you to do a deathblow. The Chained Ogre boss fight in Sekiro starts as soon as you approach the monster. As you get close, throw some oil and then follow up with a flame vent attack. Immediately begin attack with your sword until the ogre breaks free and recovers. At this point, retreat down the stairs and prepare for the fight. Danger grab: One of the ogre’s danger moves is a grab where he picks you up, slams you into the ground, and throws you. Another sees him pin you to the ground and punch you. Avoid this at all costs as it can easily one-shot you. To avoid a grab, dodge backwards. This can be followed up with a grapple attack if you have that ability unlocked and the green marker appears. Jump kick: The ogre will jump and kick out with both feet. Dodge to the side and attack him while he tries to get back up. Swings and kicks: The Chained Ogre also has a few standard kicks and swings. He will flail his arms about, trying to punch you or kick his legs a few times. Back away and let him tire before running in for two hits. In the event the pikeman comes down from the barricaded area, try and retreat to a point where either the pikeman or the ogre walks away. Either kill the pikeman or let him leave and focus the ogre. Fighting both of them at once can be a headache. The key to this fight is to simply take your time and whittle down its health. Rushing in and spamming attacks, and not watching what it's doing, is going to cost you health, a healing gourd, and a resurrection. 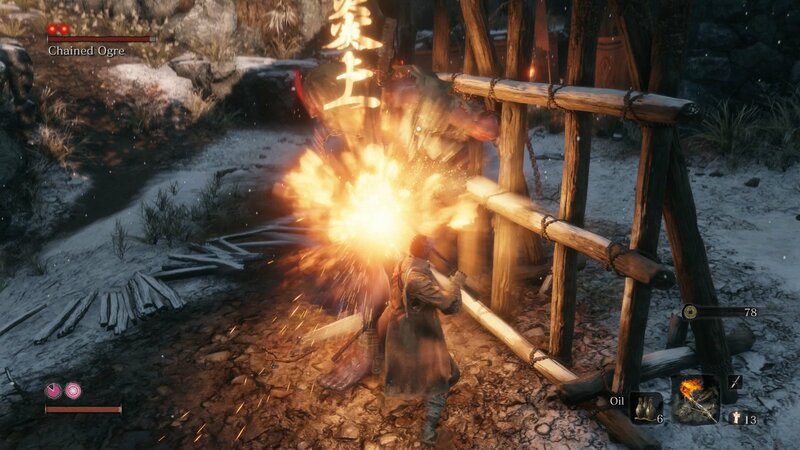 The Chained Ogre fight in Sekiro is likely going to be a roadblock for some players. After the controlled precision of the General Naomori Kawarada fight, the Chained Ogre is downright chaotic. Be sure to check out the Shacknews Sekiro: Shadows Die Twice page for more boss guides.